We get it now. Asus has proved its point. A few months back, we sat dribbling and agog as we reviewed its Essense STX sound card, and marvelled with flopping tongue at its hitherto unrivalled recording crispness and overall outward brilliance. This month, although we've not been rendered quite as floppy and pliable, the Xonar DS has us convinced that there's still room in the world for outboard sound cards (that is, sound devices which don't live directly on the motherboard). They're essential. Some of the advantages are obvious. Doing sound processing on a separate card removes electrical interference, which has a tendency to turn onboard sources into a hissing mess. This is definitely true of the Xonar DS, which gave a markedly clearer sound output than that of our test machine's bog-standard Realtek sound interface. In addition, you can often take advantage of more advanced sound processing than you'd normally have. The DS uses Asus' noted AV200 processor, albeit in a slightly cut-down form. Dolby Digital support, which the AV200 has previously been capable of, is ousted presumably to save on licensing costs. Although this is most definitely a budget card, that proper processor means it rarely shows any signs of being so. Full 7.1 support is one of the obvious selling points, and Vista users will relish the DS3D GX drivers – the Asus equivalent of Creative's ALchemy – which translate EAX 3D sound into something Microsoft's audio-challenged OS can handle with aplomb. The built-in ASIO support is a must if you're even considering recording, and with an impressive signal-to-noise ratio of -107dB the DS definitely performs in that regard. Perhaps the most exciting facet of the DS is that this is a low-profile card running on a PCI platform; if you've taken the plunge and set up a media box under your TV, 7.1 support is no doubt on your horizon. 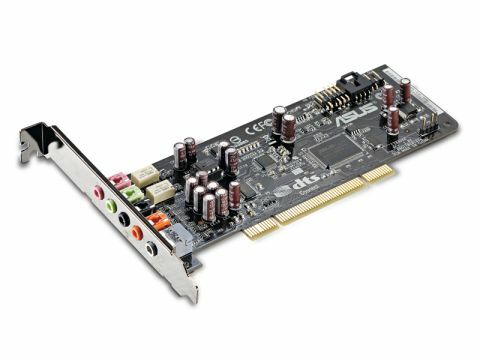 Since many media-specific boxes lack the requisite ports (and often have fairly rubbish power supplies), a PCI express card like Asus' own Xonar DX often isn't an option. Full size cards are entirely out. But the Xonar DS gets the job done under bus power, and there's an easily-installed, low-profile backplate included in the box, so it'll fit happily in any case. Full front panel support caps the package off nicely. For those who appreciate fantastic fidelity (and don't mind the lack of Dolby Digital processing), the Xonar is a real low-cost gem.